Louisiana was admitted to the Union in 1812 as the 18th state. Spread over an area of 43,203.90 square miles, Louisiana has a population of 4,649,676, according to the 2014 estimate. The Louisiana map shows the major cities and roads across the state. The map shows the major cities in yellow dots, while the other towns are shown in white dots. 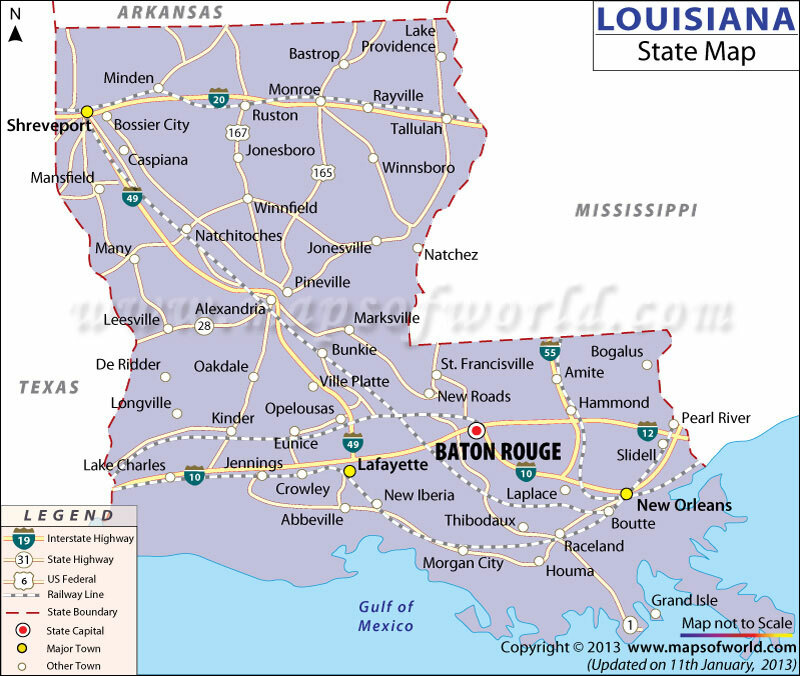 Baton Rouge, which is the state capital, is shown in a red dot. The map also depicts the roads and the highways that traverse the state. Some of the Interstates that pass through Louisiana include the I-10, which is approximately 274 miles long, and runs east from the border of Texas, through Baton Rogue and New Orleans to the border with Mississippi. Some of the other highways that pass through Louisiana are Interstate 59, Interstate 49, Interstate 12, and others.